One of our favourite products (and a firm client favourite too!) is the OilTechw² FLT oil on water sensor. A few months ago we did a case study on Northern Ireland Water and their intake protection using our clever sensors, which you can read, here. We thought we’d take the opportunity to explain why these sensors are so popular this month. Firstly, why is it important to use floating oil on water sensors? If oil enters a river – wildlife can be harmed and if it manages to penetrate a water treatment plant, it can have an impact on the processing system and damage the drinking water itself. If you’ve got an early warning for a potential problem, you’ll be able to take immediate action – whether it’s automatically shutting down the intake, or having an alarm raised for you to manually intervene. 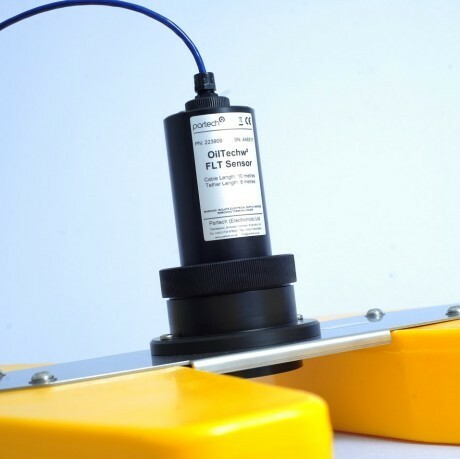 The OilTechw² FLT sensor can be used in any situation where the water surface is quite calm. The system is reactive to any oil films on the surface, whether it be a full film or just a partial one. One of the great things about the oil on water sensor is that it’s incredibly reliable and only needs occasional validation in order to ensure efficient and accurate results. The oil on water sensor has a dual hull, which allows the sensor to detect any water passing through the gap beneath it. The clever design allows the non-contact infrared sensor to emit light that is reflected from the water surface. Oil on the surface increases the amount of light reflected and this is then converted into the desired output signals. Dependent on your set up, you may want to use some of the mounting accessories for the sensor, or you may find the two fixing cables and weight are perfect to keep the oil on water sensor perfectly stationary and orientated.